This article by Matt Hayward, Senior Lecturer in Conservation, at the School of Environment, Natural Resources & Geography was originally published on The Conversation. Read the original article. Rhinos are one of the most iconic symbols of the African savanna: grey behemoths with armour plating and fearsome horns. And yet it is the horns that are leading to their demise. Poaching is so prolific that zoos cannot even protect them. A southern white rhino in South Africa.Some people believe rhino horns can cure several ailments; others see horns as status symbols. Given horns are made of keratin, this is really about as effective as chewing your finger nails. Nonetheless, a massive increase in poaching over the past decade has led to rapid declines in some rhino species, and solutions are urgently needed. One proposal is to take 80 rhinos from private game farms in South Africa and transport them to captive facilities in Australia, at a cost of over US$4m. Though it cannot be denied that this is a “novel” idea, I, and colleagues from around the world, have serious concerns about the project, and we have now published a paper looking into the problematic plan. 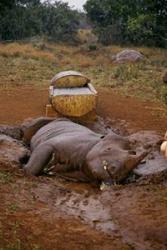 The first issue is whether the cost of moving the rhinos is unjustified. The $4m cost is almost double the anti-poaching budget for South African National Parks ($2.2m), the managers of the estate where most white rhinos currently reside in the country. The money would be better spent on anti-poaching activities in South Africa to increase local capacity. Or, from an Australian perspective, given the country’s abysmal record of mammal extinctions, it could go towards protecting indigenous species there. In addition, there is the time cost of using the expertise of business leaders, marketeers and scientists. All could be working on conservation issues of much greater importance. Bringing animals from the wild into captivity introduces strong selective pressure for domestication. Essentially, those animals that are too wild don’t breed and so don’t pass on their genes, while the sedate (unwild) animals do. This is exacerbated for species like rhinos where predation has shaped their evolution: they have grown big, dangerous horns to protect themselves. So captivity will likely be detrimental to the survival of any captive bred offspring should they be returned to the wild. It is not known yet which rhino species will be the focus of the Australian project, but it will probably be the southern white rhino subspecies – which is the rhino species least likely to go extinct. The global population estimate for southern white rhinos (over 20,000) is stable, despite high poaching levels. This number stands in stark contrast to the number of northern white (three), black (4,880 and increasing), great Indian (2,575), Sumatran (275) and Javan (up to 66) rhinos. These latter three species are clearly of much greater conservation concern than southern white rhinos. There are also well over 800 southern white rhinos currently held in zoos around the world. With appropriate management, the population size of the southern white is unlikely to lose genetic diversity, so adding 80 more individuals to zoos is utterly unnecessary. By contrast, across the world there are 39 other large mammalian herbivore species that are threatened with extinction that are far more in need of conservation funding than the five rhino species. Poaching is still a huge problem, despite a resurgence in the southern white rhino population.Rhinos inhabit places occupied by other less high profile threatened species – like African wild dogs and pangolins – which do not benefit from the same level of conservation funding. Conserving wildlife in their natural habitat has many benefits for the creatures and plants they coexist with. Rhinos are keystone species, creating grazing lawns that provide habitats for other species and ultimately affect fire regimes (fire frequency and burn patterns). They are also habitats themselves for a range of species-specific parasites. 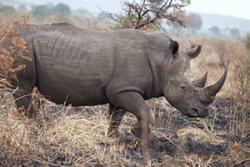 Abandoning efforts to conserve rhinos in their environment means these ecosystem services will no longer be provided. Finally, taking biodiversity assets (rhinos) from Africa and transporting them to foreign countries extends the history of exploitation of Africa’s resources. Although well-meaning, the safe-keeping of rhinos by Western countries is as disempowering and patronising as the historical appropriation of cultural artefacts by colonial powers. Conservation projects are ultimately more successful when led locally. With its strong social foundation, community-based conservation has had a significant impact on rhino protection and population recovery in Africa. In fact, local capacity and institutions are at the centre of one of the world’s most successful conservation success stories – the southern white rhino was brought back from the brink, growing from a few hundred in South Africa at the turn of the last century to over 20,000 throughout southern Africa today. In our opinion, this project is neo-colonial conservation that diverts money and public attention away from the fundamental issues necessary to conserve rhinos. There is no evidence of what will happen to the rhinos transported to Australia once the poaching crisis is averted, but there seems nothing as robust as China’s “panda diplomacy” where pandas provided to foreign zoos remain the property of China, alongside a substantial annual payment, as do any offspring produced, for the duration of the arrangement. With increased support, community-based rhino conservation initiatives can continue to lead the way. It is money that is missing, not the will to conserve them nor the expertise necessary to do so. Using the funding proposed for the Australian Rhino Project to support locally-led conservation or to educate people to reduce consumer demand for rhino horn in Asia seem far more acceptable options.